Providing safe, quality food for consumers is a top priority for egg producers across the United States. Egg producers start by implementing both mandatory and voluntary on-farm egg safety programs like the ones below. The requirements found in each program reduces the potential for transmission of Salmonella Enteritidis on-farm, significantly lowering the risk of an egg being contaminated. Click here for more information on these egg safety programs. There are many choices for fresh or raw shell eggs available at stores today—brown or white, cage, cage-free, organic, free range, or specialty eggs like omega 3. No matter what kind you decide to buy, making sure you choose a safe carton of eggs is extremely important. Always purchase eggs from a refrigerated case. Open the carton and make sure there are no visible cracks or leaking eggs. Cracks and leakage can lead to contamination of the egg and could potentially cause illness. Don’t buy out-of-date eggs and look for the USDA grade shield or mark. Choosing a safe carton is just as important as properly handling and cooking your eggs. Many eggs reach stores only a few days after the hen lays them. Two dates can appear on the egg carton. Egg cartons with the USDA grade shield on them must display the “pack date” or the day that the eggs were washed, graded, and placed in the carton. This number, called the Julian Date, is a three-digit code that represents the consecutive day of the year starting with January 1 as 001 and ending with December 31 as 365. The “sell-by” or “expiration” date is not required by the federal government, but may be required by the egg laws in the state where the eggs are marketed. Always purchase eggs before the sell-by or expiration date on the carton. The term “egg products” refers to processed or ready-to-use forms of eggs obtained by breaking and processing shell eggs. Egg products you see at the store may include whole eggs, egg whites, and egg yolks in frozen, refrigerated liquid, and dried forms available in a number of different product formulations like cake and cookie mixes, as well as specialty egg products. Specialty egg products can include pre-peeled hard-cooked eggs, egg salad, pre-cooked omelets, egg patties, quiches, scrambled eggs, fried eggs, and others. When purchasing egg products, look for containers that are tightly sealed and packages that are unopened. Although egg products have been processed, it is important to follow all cooking instructions on the packaging to ensure maximum safety. Refrigeration — After the shell eggs reach home, it is very important to refrigerate them at a temperature of 45 °F or below. Keep the eggs in their carton and place them in the coldest part of the refrigerator, not in the door. Storing eggs in the refrigerator door could lead to temperature fluctuations that can lead to bacteria growth. Eggs may be refrigerated 3 to 5 weeks from the day they are placed in the refrigerator. The sell-by date will usually expire during that length of time, but the eggs are perfectly safe to use. Liquid egg products should be kept refrigerated at all times and consumed within two to six days from the date of purchase. Once liquid egg products are opened, they should be used immediately. 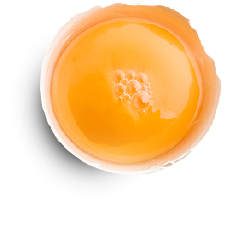 Freezing — Fresh shell eggs can be frozen, however, NOT IN THE SHELL. For whole eggs, yolks and egg whites, remove egg from shell and place in tightly sealed container. Label with the date. Refrigerated liquid eggs can be placed unopened in the freezer. Both fresh shell eggs and refrigerated egg products can be stored in the freezer up to a year. For frozen eggs and products, it is important to defrost only as much as needed. To defrost, place unopened containers in refrigerator or under cold water. Frozen egg products cannot be refrozen once thawed. Thawed eggs products can be stored in the refrigerator no longer than three days. Dried egg products should be stored in a dark, cool place and kept in their original containers. Once reconstituted, either use the product immediately or store in the refrigerator for no more than four days in a tightly sealed container. To prevent the spread of bacteria, it is important to start with a clean area and clean utensils. Wash your hands, utensils, equipment and work surfaces thoroughly in hot, soapy water for at least 20 seconds before and after you come into contact with any food. To prevent cross-contamination, rewash after you prepare each item and before you prepare another food as well as after you use the bathroom, change diapers, come into contact with body fluids or handle pets. Cross contamination is the spread of bacteria from people to food or from one food or piece of equipment to another. To guard against bacteria surviving in pores, use plastic or other non-porous cutting boards. Clean them thoroughly each time you use them by running them through your dishwasher or washing them with hot, soapy water. For further protection, sanitize them with a bleach-like solution. Use paper towels or wash cloths (changed often) to clean kitchen surfaces. Use only clean eggs with unbroken shells and discard any eggs that have become unclean, cracked, broken or leaking. Eggshells are washed and sanitized before packing and incorrect home procedures might infect the contents, so avoid washing eggshells before you use eggs. It is important to cook eggs thoroughly to destroy bacteria. While light cooking will begin to destroy any bacteria that might be present only proper cooking brings eggs to a high enough temperature to destroy them all. For eggs, the white will coagulate (set) between 144 and 149° F, the yolk between 149 and 158° F, and whole egg between 144 and 158° F.
Egg products made of plain whole eggs are pasteurized, or heated to destroy bacteria. The pasteurization process consists of bringing the eggs to 140°F and keeping them at that temperature for three and a half minutes. While this temperature destroys bacteria, it does not thoroughly cook the product. For scrambled eggs, omelets and frittatas, cook eggs until no visible liquid remains. Fried eggs should be cooked until the whites are completely set and the yolk is thickened but not hard. For classic poached eggs, cook gently in simmering water until the white are completely set and the yolk begins to thicken but are not hard. Avoid precooking and reheating poached eggs. Hard cooked eggs should reach an internal temperature of more than 160°F. After cooking, cool hard-cooked eggs under water or in ice water. Immediately after cooling, refrigerate eggs in their shell and use up to one week. Other foods that contain eggs, like French toast, quiches, baked goods and casseroles, make sure that the dishes are done and prevent uneven cooking by using a thermometer in the center and around the sides of the of the dish. The thermometer should reach 160°F. For custards, eggnog and ice cream bases, cook until the mixture reaches a temperature of 160°F or higher. After cooking, cool quickly by setting the pan in ice or cold water and stirring for a few minutes. Cover and refrigerate to chill thoroughly, at least one hour. For meringue, bake until the meringue reaches 160°F (about 15 minutes). The more egg whites, the lower the temperature and longer the time you need to cook the meringue through without excessive browning. Refrigerate meringue-topped pies until serving. Return leftovers to the refrigerator. While proper cooking destroys any bacteria that may have been present in an egg, an egg dish may be cross-contaminated after cooking by people, other foods, cooking utensils or equipment. During a party or a picnic, this is very easily done. If a dish is contaminated, bacteria will multiply rapidly at temperatures between 40 and 140°F. Promptly serve eggs and dishes containing eggs after cooking. If you are serving buffet style, use ice or freezer packs with commercial coolant to keep cold foods cold (40°F or lower) and food warmers or thermal containers to keep hot foods hot (140°F or higher). Serve buffet foods in small dishes and replenish them with fresh dishes often, rather than leaving foods at room temperature where bacteria can thrive. If you are bringing raw eggs or hard-cooked eggs to a picnic or camping, leave them in their shells. Pack them along with deviled eggs and other cold dishes in an insulated bag or cooler with ice or freezer packs. Keep the insulated bag or color in the shade and open it as infrequently as you can to help keep these foods at 40°F or lower. Use thermal containers to keep hot egg dishes hot, 140°F or higher. Whether heated or on iced, foods should not be left out or exposed for more than two hours. The holidays are a perfect time to eat eggs and egg products. During Easter, it is very popular to color fresh shell eggs. Before any type of interaction with eggs, it is important to first wash your hands and your working area thoroughly. Continue to do so at every step including cooking, cooling and dyeing of eggs. It is important to refrigerate hard-cooked eggs in their cartons if you won’t be coloring them right after cooking and cooling. Color only uncracked eggs. If any eggs crack during dyeing or while on display, discard them along with any eggs that have been out of refrigeration for more than two hours. If you keep hard-cooked eggs out of refrigeration for many hours or several days for a decoration or for hiding, either discard the eggs that have been left out or use them only for display. If you hide eggs, consider hiding places carefully, avoiding areas where the eggs might come into contact with dirt, pets, wild animals, birds, reptiles, insects or lawn chemicals. Refrigerate them again right after you dye them, after you display them or hide them.